Located in St. Petersburg historical center close to Tavricheskiy Garden and United States embassy. Spacious one-room apartment (50 sq.m) with a small kitchen and shower bath is located on Chaikovskogo str. (walking distance from Chernishevskogo metro station). Ground floor of ancient building. Front door with marble stairs. Light room. There are: one euro-standard double bed, cable satellite TV-set, functional furniture and a wardrobe. Soft cosy sofa can be transformed in the additional place for sleep. The kitchen is furnished with electro stove and a kettle. Electric heater provides shower-bath. There are no internet and telephone at the apartment. 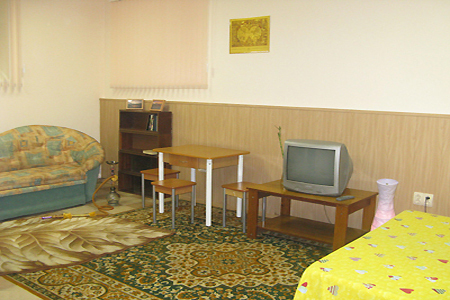 The apartment is suitable for up to 2 persons. There may be an extra charge if the number of people exceeds 2. This is usually equal to 10 euros extra per person above 2 people. A lot of shops, cafes, restaurants.